Every life contains elements of trauma that put in place limiting beliefs, blocks and obstacles that hold you back from reaching your unlimited potential. Especially when trauma leads to posttraumatic stress disorder (PTSD) your potential can become a prisoner of the past. Freeing yourself means discovering how to access and inhabit the deep source of your courage. Trauma and PTSD expert, survivor and author, Michele Rosenthal, joins Dr. Pat to talk about her latest book, Heal Your PTSD: Dynamic Strategies that Work, and how anyone can launch a healing rampage to break through the limiting Crust. Michele Rosenthal is a popular keynote speaker, award winning blogger, award nominated author, workshop/seminar leader, and certified professional coach. She hosts the radio program, Changing Direction, and is the founder of www.HealMyPTSD.com. Michele is a trauma survivor who struggled with PTSD for over twenty-five years. She is now 100% PTSD free. She is the author of Before the World Intruded and the recently published Your Life After Trauma (W.W. Norton). Dr. Pat: I’m so glad to have Michele Rosenthal join me here today, “Heal your PTSD: Dynamic Strategies that Work,” and why is this such an important conversation? Because I want to just say to everybody – and Michele’s going to talk about, we didn’t talk about this -- about her journey, what this is about. You know, keynote speaker, award-winning blogger, nominated author, all of the above. But here’s what I know about somebody that writes about a topic like this – passionate. Passionate about helping us understand how to heal – passionate about it. How do we become passionate about something like this? Well, you know, here’s what happens. We actually experience trauma in our lives and when we experience trauma in our lives, we have to face that thing which we are willing to teach others. Now me? I stuttered as a kid. I am not going to be the person that got picked to grow up in the world and have a positive talk radio show. No. But what did I have to get past to do that? When on, and here’s what I’m going to talk to her about today, there’s so much in this book, “Heal Your PTSD”. We have right now in the world – and Michele, let me welcome you to this show so we can talk about this together. Welcome to the show, it’s great to have you here. Michele: Dr. Pat, thank you so much. I’m delighted to be here. Your energy is awesome and I’m really looking forward to chatting with you about this. Dr. Pat: This is really interesting, so let’s start with the conversation. First of all, thank you for writing this book, and thank you for doing what you do in the world on this topic. I really appreciate you. Of course as a kid who then ended up with PTSD, I couldn’t. But as an adult who healed, I remembered the promise that kid had felt she should make and so, I appreciate your mentioning your appreciation because I feel like every day what I do is for that girl who survived – and that means everything. Dr. Pat: Well, let’s talk a little bit about this, because we’re living in a really interesting time, 25 years, right? You had to work through a horrific illness. You had to work through some things in the world. You and I kind of share the illness journey together here. That’s something we have in common. But beyond looking at surviving it, we’re talking about a solution that has to do with thriving. When you mention the word; “thriving,” to me, there’s got to be a healing journey involved. What are the obstacles? What are the challenges that you personally had to overcome on your journey to this? Michele: Well, I’ll share with you my own personal obstacles and at the same time process it by saying I am not unique. Everything I am about to tell you I have heard other survivors, when I share my story, say, “Yes! I felt the same way!” We all feel so isolated and alone in our trauma and our recovery processes, and of course there are aspects and elements that are unique to each of us but what I’m about to share is so universal because it’s human. The number one obstacle in recovery to me was fear. It was just out and out, straight terror of what the healing process was going to require of me, what it was going to take from me, and how I might get lost in it and not be able to be pulled back out. The number one obstacle was fear. The number two obstacle was there’s no prescription for healing after trauma or post-traumatic stress disorder. Let’s just say you have bronchitis, you know what to do; you take your anti-biotic and 72 hours you start to feel better. But with trauma and post-traumatic stress disorder, there is no one solution and there is no one way, there are many ways. Each of us has such an individual and unique healing process that you just have to sort of bang around trial-and-error until you figure out yours. The biggest obstacle after fear was I didn’t what to do, and in that place you can get really stuck, and demoralized, and lose all hope. Dr. Pat: Yeah. This idea of not knowing what to do, I’m really struck by this in so many ways because what the book really is, “Heal Your PTSD,” and I just want to say for those of you listening to this show, I’m going to open up the phone lines here. I’m going to do it early in the show in case any of you have a question for us, you can call into the show, 1-800-930-2819. But you can also go to Transformation Talk Radio and scroll down and you’ll be able to type your question in if you have a question and you’re not able to call into the show. One of the things that I think I’m really struck by in the conversation is what the definition of PTSD is. Because we have an idea about it that has to do, Michele, with, look, this is PTSD. Grew up in the Bronx, was walking down the street, somebody pulled a knife on me, my life was forever changed – that’s one version of it. Another version is; went off to Iraq, came back and oh, my gosh, PTSD. But people see PTSD as black and white. Sometimes we don’t stop to say, and maybe you can help me out here, we don’t stop to say, “You know, these past eight years with the economy and people losing homes, and people losing jobs, and folks now 50, 55, they cannot get jobs, boy, they do not have any right to claim PTSD.” Now, can you help me out here with the big definition or are we in a box around PTSD? Michele: I do not like boxes. So we’re going to bust out of that box right now. There are no boxes, as far as I’m concerned, in PTSD. Because that was one my biggest issues with my PTSD experience is when I did look for help. My parents were very clear that there was something not right about and they would take me to different specialists, they all tried to put me in a box. I didn’t fit the box so I never got the help that I really sorely needed. You’re making such a great point because the media covers PTSD purely, and almost exclusively from a military perspective. But actually, PTSD comes in all walks of life because it is at its core the experience of life-threatening danger. Each of us has a different threshold for what that kind of stress does to us and how we interpret that kind of situation. We can define trauma baseline in three simple ways; number one, any experience that’s less than nurturing, so can you think a person on the planet that hasn’t experienced that? Dr. Pat: Yeah, right, exactly. Michele: Two, an experience that overwhelms your capacity to cope. And number three, an experience that changes the way you see yourself in the world. So that’s just a baseline definition of trauma. Now, post-traumatic stress disorder happens when longer than four weeks you experience symptoms of an activate survival-mode. Those symptoms are in four categories: avoidance, re-experiencing, mood alterations, and hyper-arousal. When you start looking at it that way, I know people who have been diagnosed with PTSD because an acrimonious divorce where they are terrified that they’re going to be homeless. Out on the street, without any money, without a home, and dealing with a spouse who’s violent and physically aggressive. You don’t think about that necessarily in terms of PTSD right off the bat but it is a precursor for PTSD. Even in children, we see neglect as a precursor for PTSD. You might think, well how’s that possible? That just means the child is by himself, nobody is hurting him. But to the child, neglect is hugely life-threatening. Who’s going to feed them? Who’s going to clothe them? Where are they going to sleep? Who’s going to pick them up after school? It’s terrifying. To pull all this together, what we’re really saying is PTSD is an experience of a life-threatening perspective and everybody that can be different but at its core it’s a sensation of enormous powerlessness in the face of something that threatens your well-being. Dr. Pat: Good. Having said that now, we’re going to take a break and when we come back, we’re going to talk about the state of affairs of why this body of work that you have right here in this book is so significant in the world we live in today. What is it that Michele means when she says; “Every bad behavior begins with a good intention”? I will tell you, I know exactly how that has played out in my long lifetime here. We’re going to take a short break. When we come back, “Heal Your PTSD,” we have opened up the phone lines, yes. Because whether you’ve been through a divorce, not a divorce, whether you know somebody that is really struggling in their lives, we’re going to take you on a journey on how it shows up in our behavior or how it shows up in the way we look at the world. We’re going to take a short break. Thank goodness, Michele Rosenthal’s joining me here today; “Heal Your PTSD,” folks, we’ll be right back. Well, Michele, we’re going to talk about that much more, but before we do, how can folks find out more about you, your radio show, and how can they get a copy of your book? Michele: Absolutely, well, the book is just officially released yesterday, so it is available at all the usual places online and bookstores near you. All of the information about all of my books including, “Heal Your PTSD,” and our podcast, and we have free training webinars about the science behind your symptoms – all of it is on healmyptsd.com. Which is a website that grew out of my original blogging about my PTSD recovery – and then the next thing we knew an entire community had just formed around it? The healmyptsd.com website has been around for a long time and is really geared to give you the bottom-line information about symptoms and treatments, and everything you or your loved one, or your client, or your patient needs to know about healing post-traumatic stress disorder. Dr. Pat: Wow, and thank you. Thank you so much for that because the reason, I think, that people was starting to pay attention is it’s like what we were talking about during the break but also before the break. There’s a level of trauma that has happened in the world in these past eight – some people say 10 years, but let’s just say eight years – that no one is really talking about. We’re starting to see new BMWs on the road now. Everybody’s got a new car, new – and it’s as if what we’ve just gone through, we’re going to just brush it under the rug. But I read something, and I love for you to talk about it, I read a little saying that said – let me see if I can remember it – said something like, oh, “Change is difficult. Not changing is fatal.” I thought; “I’ve got to talk to Michele about that,” what do you think? I was living in a world with invisible pain…. Michele: No, I don’t think it’s invisible. I think it’s visible everywhere you look. I think partly what drives our internet connection, I mean, we live in a high-tech, constantly super-uber connected world. Partly that’s because the information highway is unending. But partly it’s also I think you’re seeing an enormous need of people to connect. Often we’re driven to connect out of pain, and fear, and the need for support and love, and the feeling of being a part of something so that we don’t get so lost in our own self. I think the pain that’s going on right now is visible certainly whenever you log-on to a news website, or turn on the news at night. But even if you just listen to conversations around you. I was out to lunch earlier today with my brother and at the table next to us, two women were talking about something that you and I were just talking about during the break and it’s job loss. One had just lost her job and she just doesn’t know how to begin looking for another one, because she’s not in the 20 to 30 age range, and there’s the dearth of opportunity. At the beginning, when you’re first dealing with, “Ok, this is a huge change,” I think really at the bottom of all change is fear. It’s fatal not to change but it can feel fatal to approach a change. Dr. Pat: Right. Right, let’s talk about a couple of the things you mentioned here. I said something from – I read something from the book about this idea of intention, and what that means in the book, and you talk about that. Then you also say that PTSD recovery has a very specific outcome. I want to talk about that because we so often talk about the trauma but let’s talk about recovery for a moment, if we could. Because I don’t know about you, but when I was in the middle of what was going on with me I don’t know that I could grasp that there was going to be a positive outcome. What have you discovered? Michele: I totally agree. During my recovery I had no idea whether or not I was going to make it. Twenty-four years between my trauma and my PTSD diagnosis and during those years I had just come to accept myself as a crazy person. I thought some people in this world are crazy and I’m supposed to be one of them. I think what happens is so often, we get stuck in a mind-set. Then when you get your diagnosis you say, “Ok, how do I get this done?” nobody knows. Nobody knows. Nobody can predict what’s going to be the outcome for you because there’s so many factors involved not the least of which is your own internal resources, your dedication, your persistence, your resilience, and your willingness to walk through the fire of recovery. I think you’re so right, the outcome – to answer your question directly – is I don’t think anyone can predict for anyone else what the outcome will be. What I will say is the best possible outcome, and what I myself and many others have been able to create, is living symptoms-free. Getting to a place where I no longer have PTSD symptoms even when I’m triggered no symptoms pop-up. To me, we start our recovery, each of us defining what we want the outcome to be. I’ll share with you something interesting. When I first started this work of leading this enormous PTSD community and working with clients, and writing all these books I thought everyone wanted what I wanted in recovery which was I was determined to kick it and be done with PTSD. That I discovered was pure hubris. You can’t assume what somebody else wants because I’ve spoken to many survivors who that’s not what they want all. They consider healing being able to cope with symptoms better and be functional. I think each of us can and must define what we want our specific outcome to be. There’s a spectrum for that; at one end is, “Nothing changes,” and at the other end is, “Everything changes.” Knowing that that’s the possibility allows you to decide where you want to be on that spectrum. Dr. Pat: One of the things that I so love talking with you about, and there are many, is the world of possibilities. I want to use a word, if I could. I remember when I got a diagnosis in 2004 and I pretty much didn’t share that with anybody. I grew up in a culture – and I would love to talk to you about this when we come back because there’s a culture question around PTSD. what I want to talk about, what are the secrets, the stigma of post-traumatic stress disorder? What are they? Do they serve us or not? That’s why I’m not having a talk about this, that’s why Michele had written a book, “Heal Your PTSD”. What is it about just saying “PTSD” that can trigger something emotionally and physically in our bodies? We’re going to take a short break, everyone. Michelle Rosenthal joining me here today. Again, when we come back, we’re going to make sure we’re going to give you lots, and lots, and lots of information on her, her work, her blog, everything else. Stay tuned, we’ll be right back. Dr. Pat: Hey everyone, welcome back. 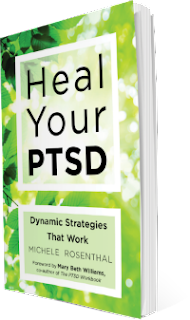 I am so glad Michele Rosenthal joining me here today – “Heal Your PTSD”. For those of you out there, I want to say this from my own journey. There is a journey that each of us get to say “yes” to and we get to go on. My healing journey has enabled me to have this forum here. This particular forum –thirteen years now in the making, that had I not gone through what Michele is talking about here today, what we’re talking about, I would have walked away from doing this radio show. But because of my own journey with healing, I had to choose. Am I going to make a commitment to have a radio show? Kind of going against the grain,– myself and my friends a Conscious Talk. Thirteen years ago, there was literally five of us – all women – that made a conscious decision to do this. Now in the world, we are helping so many others to have radio shows, media, video broadcast – that open up a door for listeners all over the world, to heal in whatever way. But here’s what I know about PTSD – it is stigmatized, saying it. Whether you are from ex-military or ex-divorcee or ex-employee – it doesn’t matter. This is a terminology that you might as well be calling it “Lyme Disease”, as we know what that’s about. Michele: I would say, “Yes and yes.” I think before the break, what we’re talking about is “pain invisible or visible” and the pain is visible. Sometimes I think we don’t have the name for it – which is often what makes PTSD so invisible. That really speaks to the invisibility of the PTSD illness, because you can’t see what’s wrong with us. You can’t see that a trauma affects the brain from a neurophysiological, chemical, and biological perspective in ways that the regular eye can’t see. You can be standing in front of someone at the grocery store, up at gas pumps, at a concert, at a meeting – and not see that their amygdala is over-firing threat detection. That their hippocampus is underfiring so it’s not consolidating memories properly. You can’t see that their sympathetic nervous system is jacked up and their cortisol is really high. Those are the invisible parts of what PTSD is. I think the stigma comes from the fact that you can’t see it. Like if I actually had my leg in a cast, you’d understand I couldn’t run a marathon. But if you can’t see that my brain is not functioning properly, it’s hard to believe I can’t get to the meeting on time. Part of the stigma comes from, that you can’t see the changes that PTSD physically, mentally and emotionally causes. Part of the stigma too, I think it’s back to what we we’re talking about earlier Dr. Pat, and that trauma is so highly personal. I have a very, very, very dear friend – actually been my friend since 1973. Very unexpectedly, very suddenly driving down the road – literally found the car flipped over, hit a tree and it’s a car accident. That when you think about it, this is one of the best drivers that you’d ever want to meet. Just the idea of just going and looking for a new car and then getting a new car and then actually driving a new car is traumatizing. In the day we live in, that is something that if we think about it, many of us don’t know how to help her. See, because we don’t. Our solution is “Well honey, why don’t you just go get the car with you and then come back and don’t drive the car, have your sister do it,” and then “Why don’t just drive it around your parking lot?” Right? This is me. Michele: I think you’re giving actually a good advice. Michele: In my last book, “Your Life After Trauma”, I wrote about a survivor who I’d worked with who had been in a car wreck and we eventually got to the place that you’re talking about. There is a state of recovery that is exactly what you’re discussing. It’s just those are phase before that. The phase before that has a lot to do with rewiring and retraining the brain to bring down the level of stress hormones to help the amygdala stop firing so much to help the hippocampus start processing – how the memories are consolidated, changes how you feel about the memory. For example, how trauma affects the brain makes a huge difference in recovery and the ways to reverse those changes. Before we can even ask your friend to get back into the car, we have to stop the reaction that’s happening in her mind and her body because those two things are so interconnected. So that before she gets in the car, everything changes within her. From her perspective of herself and her safety and her ability to control that safety, to the way that her body chemistry is responding. So that when she finally does get in the car, she feels much more calm and able to manage any of the stress that that situation itself brings up. Does that make sense? Dr. Pat: Yes, it does. I’m sitting here and as I was reading your book, I didn’t think about it until about two minutes ago. You know myself, I had a car accident in 2011 in December. No one really thinks about what you just shared about the phases. Because whether it’s a car accident or a job loss or something else, how do we get people help? I mean think about it, if you’re still being triggered and you’ve not gone through that phase you just talked about, right Michele? We haven’t gone through it. Now we’re getting behind the wheel of a car and it’s maybe even two weeks – that is a scary moment. What can happen when we are triggered? This is really important, because I know we’re talking about a car. But it could be divorce – it could be anything. Michele: It absolutely can and I talk about this a lot in “Heal Your PTSD”. How trauma affects the brain in a different ways that that causes the brain to dysregulate itself. Literally during a trauma, your brain switches from being run by your cortex – the most highly developed part of your brain that makes all of your decision making and executive function. That part of your brain actually goes offline. During a trauma, your reptilian brain – the innermost, most old part of your brain that is super survival-oriented – that’s the part running the show during a trauma. That’s the part you want running the show. It’s the part that activates your survival response gets you ready to fight, flee or freeze, so that you can survive. The problem with PTSD is that we get stuck in that place. When we get stuck in that place, that’s when the real problem starts to occur. That’s why the phases of recovery are so important to respect. Because you don’t go from a hundred miles an hour of survival mode straight into recovery – you sort of have to reduce your speed, switch gears and then switch into the lane of recovery. Those two things are very distinct and they need time for both, because your body is used to segueing naturally from reactive mode to responsive mode, which is when you rest and repair, and then back. It needs to be told and make that manual switch, sometimes after trauma, to get in to responsive mode. It’s from there, the healing can really begin. Dr. Pat: I love it. We’re going to take a short break. When we come back, we’re going to talk about something Michele talks about in the book –which rarely gets talked about. That is activating your Self-definition Process. What happens when we are so focused in the trauma of things of what didn’t go right? How does it affect us as individuals? How does it affect us? How does our identity suffer from this? How do we get back a level of confidence that we’d had in a situation that has now been wounded? Stay tuned, we’ll be right back with the show. Hey, everybody, welcome back. Welcome back to the Dr. Pat Show. For more information about us, go to Facebook “The Dr. Pat Show” or Twitter “The Dr. Pat Show”. Michele, if you take a minute and please let folks know again how they can find out more about you and how they can get a copy of the book. Michele: Sure. “Heal Your PTSD – Dynamic Strategies That Work” is available everywhere – books are sold. Online and offline, you can click your way or walk your way straight into pick up your copy. It’s a very easy-to-read book. I designed the whole book in short, little, chunked-down healing steps. Because I remember as a survivor – healing, I was so overwhelmed by the process. As I was writing the book I thought, “Let’s make this manageable,” and so that’s really what the book is designed to do. Someone asked me yesterday, other stories in the book – because I can’t read the stories of other people who have been hurt and my other book have stories. This book – zero stories. It’s really just about you and your healing process. Dr. Pat: Wow, thank you for that. One of the things I said before the break is there’s a part in the book that says, “Activating your self-definition process”. Before we jump to that, I really want to just mention the song that Benny played. Many people in this country and around the world have had a new level of awareness from the movie “American Sniper”. About war and the level of war and PTSD from the aftermath of people that is serving for our country now. That’s one form of it and we’ve talked about a couple of others. What do you think is the leading – if there is a leading, leading cause of PTSD today? Michele: This is going to be off-the-record, because I’m not a statistician. But in my practice and I’ve been working with clients for many years, the leading cause in my practice and so let’s just say if we exponentially max that out is childhood sexual abuse – and that’s both men and women. I would say following right behind that is childhood abuse. We have such an enormous number of survivors in the PTSD community who were unfortunate enough in childhood to be around adults who were sometimes just outright cruel, or disturbed or negligent and so they didn’t see that somebody else was harming their child. That is devastating and it’s heart-breaking and that is what I see as the leading problem in terms of causing PTSD on a large, large scale. Dr. Pat: Wow. We are hearing lots and lots more about it, but I think we’re at the tip of the iceberg actually with some of that. How do we talk with folks that – as we talk about in the book, suffering post-traumatic? I mean beyond suffering that, there’s something that happens to us as people, our identity, our confidence, our perspective and you talk about this in the book. I would love for you to share what part of the process this is and why is it so important to begin to value things in our lives again. Michele: That’s a great question. One of the reasons that I went into it in such depth in Heal Your PTSD is because I feel it’s such an integral part of the recovery process and nobody talks about it, so often. This gets back to what we’re talking about earlier – the obstacles to recovery and fear. One of the big fears is it’s attached to one of the big ironies and there are many in PTSD recovery. But one of the biggest ironies to me is that all of the PTSD symptoms we have are designed to help us feel safe and in control. The hyper-vigilance, the avoidance, the remembering, the intrusive thoughts, the re-experiencing, the mood alterations – they are all designed to help us feel safe and in control after experiencing something that made us feel powerless and in danger. Then what happens, we perfect these symptoms to such a degree that they start taking over our lives – I say that suspiciously because it’s not like we’re doing it on purpose. But we become really good at these PTSD symptoms and they make us feel like, “Okay, I’m going to see the next dangerous thing that’s coming.” Then we end up completely non-functional. Your faith was having to dismantle all of who you’ve become which is a great thing but it’s terrifying. Because if you’re going to ask me to let go of all of my coping mechanisms, who am I supposed to be without them? If I would spend two years, 20 years, 40 years with PTSD symptoms and now you’re asking me to let them all go, who am I going to be now? That’s why the self-creation process is so important and it has to begin at the beginning. I’ve studied trauma theory starting in the 1800s all the way to modern day. Everything I read places the identity and the re-conception piece at the end. I wonder why. Because how am I supposed to feel the strength and the confidence in my recovery process if I have no connection to who I am that feels good? To me and the reason there’s a whole section in “Heal Your PTSD” about how to do this, is because feeling self-esteem, feeling self-confidence helps activate resilience. There are scientific studies about this. The benefit of creating a new self-perception, a new connection to who you are and a new identity – the new you, is that once you do that you put in play a process that helps you transition more smoothly and effectively and efficiently out of PTSD and into a way that’s symptom-free. A lot of times I hear survivor say to me, “Well I’m at the end of my recovery but nobody taught me how to live now.” And I say, “Exactly,” that’s why we need to start this stuff at the beginning of recovery. So by the time you’re done, you already have a bridge to walk across into the new life. That bridge is the connection to who you are that you’ve chosen, who you want to be, how you want to live and how you want to show up in the world. It’s on that strength that you walk across that final bridge. Dr. Pat: There is so much more you and I can talk about. I love the book. I love what you’ve put together because it is a way for people to have a strategy. Really, this is what the book says, “Dynamic Strategies That Work”. What I also love about it is that we can take a look at our lives and places we are stuck. Because “stuckness”, in fact, is a one way to look at a place in our lives that we may have a trauma from who knows when, right Michele? Who knows when? But thank you so much for what you’ve done and how you continue to really guide people down this pathway to healing. I have one last question and thank you so much. Give out your website again. What’s your personal message? What would you like to leave us with here today? Michele: My personal message is this: every, single one of us has enormous healing potential. The goal is learning to access it. To do that you have to dig deep, you have to try hard and you have to determine to persevere. But that’s the real message is that each of us has that healing potential and nobody can take that away from you. No healing professional can say, “Oh you can’t be healed.” They have no clue. It’s up to you to hope that you can feel better, believe that you can do the required work and follow through – regardless of the obstacles, until you reach what you consider the end. Dr. Pat: Wow, thank you so much. One more time the website and let folks know how to get a copy of the book and thank you so much. Michele: Thank you, Dr. Pat. This has just been so wonderful. You are a terrific presence and a very creative mind. It’s been an interesting conversation and I thank you. The book is called “Heal Your PTSD – Dynamic Strategies That Work”. I know that from experience, because I’ve used them myself in my recovery process. It is available everywhere books are sold, both on and offline. We also have the audio version. If you do not want to read or don’t have the time or it’s easier to listen, we have that available too. Dr. Pat: All right. Thank you. For those of you listening to Transformation Talk Radio and even if you are not, we’ve got lots of programming coming up this afternoon. We’ll see you next time.